Argentina's presidential candidate Cristina Fernandez de Kirchner makes the victory sign to supporters at her party's headquarters in Buenos Aires. Fernandez de Kirchner's triumph is certainly historic. She has become the first woman elected President of Argentina, though not its first woman President. Vice-President Isabel Peron assumed the office in 1974 following the death of her husband Juan Peron. (She is currently in Spain fighting extradition to Argentina on charges related to death squad activities.) And Fernandez de Kirchner will get to continue the policies of her popular husband Nestor Kirchner, who is credited with saving Argentina from a profound financial crisis. Indeed, the couple's supporters in their Peronist Party believe there is more history to be made and that Fernandez and Kirchner will alternate presidencies, thereby sidestepping the constitutional ban on reelections beyond two consecutive terms and perpetuating themselves in power for an extended period. Says one Peronist insider, "They are calling it the four-by-four" strategy. Yet, the election has revealed a potential weakness. Despite her massive victory, the vote highlighted a growing polarity between the urban middle class  most of which voted for the centrist Carrio, who placed second in the national balloting  and the suburban working class and rural poor who are the traditional Peronist bastions of support. In fact, "Cristina's" campaign reminded many political observers of the tactics of Argentina's most famous and effective politican, Eva Peron, Juan Peron's second wife. Evita's "Rainbow Tour" of Europe in 1947 saw her meeting with the Pope and other European leaders, mesmerizing crowds with her beauty, glamor and brashness. Her supporters back home  the impoverished "shirtless ones"  loved it. Fernandez de Kirchner may have banked on a similar adulation when, at the tail end of her campaign, she flew to New York, Washington, Paris, Germany and Latin American capitals to be photographed with German Chancellor Angela Merkel as well as Bill and Hillary Clinton. All the while, Argentine media followed every meeting and wardrobe change. While they may have shored up her base, the traveling and the glamor opened Fernandez de Kirchner up to ridicule among her rivals for the presidency. Said Carrio during the campaign: "Eva was a political heroine, a real queen, not a Botox queen." Several took on Cristina's lavish makeup, hair extensions, heavy jewelry and constant wardrobe changes. Says an Argentine journalist and long-time observer of Fernandez, "She was more real as a person when she was a lowly Senator. Now she has transformed herself completely." That kind of criticism, however, is only cosmetics-deep. What may hurt the Kirchners more is that the middle class is concerned enough about the direction of the government to have voted for Carrio, who campaigned on the issue of corruption. Ironically, Fernandez made her reputation as a crusading anti-corruption legislator, but recently her husband's administration has been dogged by financial scandals involving high officials as well as allegations that cost of living indices have been manipulated to camouflage President Kirchner's failure to grapple with inflation. His wife, the new President, will have to deal with those issues as well as others she chose not to confront during the campaign, including the demand by labor unions for wage increases, plans to generate more foreign investment in Argentina, the country's increasing energy shortages and the rising tide of urban crime. 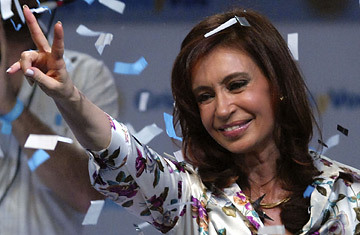 At the moment, Cristina Fernandez de Kirchner is basking in her victory. She emphasized what she saw as her "double responsibility" as a politician and as a woman toward her fellow women. She dismissed attempts to compare her husband and herself to the Clintons or her to Eva Peron. "There's nothing better than being yourself." Carrio, however, is taking some satisfaction in coming in second. Crediting the Peronist party organization for getting out its vote, she said "I'm a woman without a political apparatus and without a husband, so I did pretty well." Furthermore she said, "The Civic Coalition is here to stay as a modern, civilized republican force that could provide the next President in four years' time." And, who knows, that President may be a woman too.